This is a guest post from Ann Cortissoz, a writer in the Marketing and Communications department and editor of the member magazine, blue. 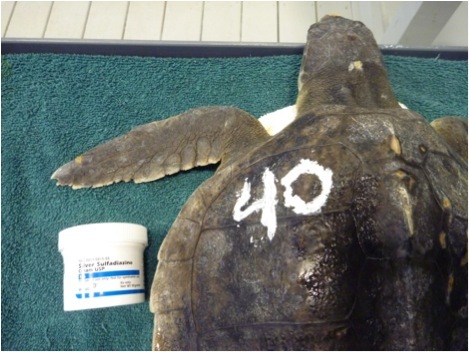 She volunteered to help the Rescue team during the height of the sea turtle stranding season. 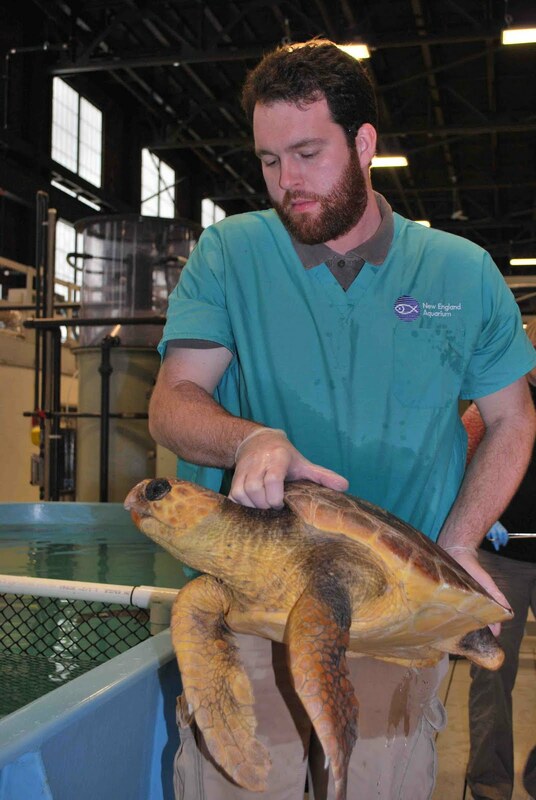 I'm an Aquarium staff member who doesn't usually work with Rescue and Rehab, so when I went down to Quincy to lend a hand at the Animal Care Center, two things struck me over and over again: When you're rehabbing rescued sea turtles, you need patience and organization—lots and lots of both. 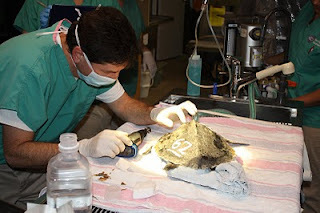 The day I was in Quincy, more than 70 turtles were being treated. 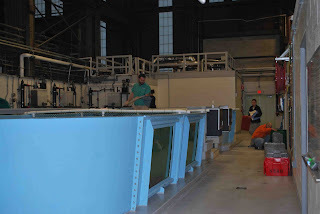 Most of them were swimming in the big tanks, but some of the animals that weren't yet strong enough to be in deep water were in kiddie pools, and these animals had to be watched over by a volunteer acting as a lifeguard. 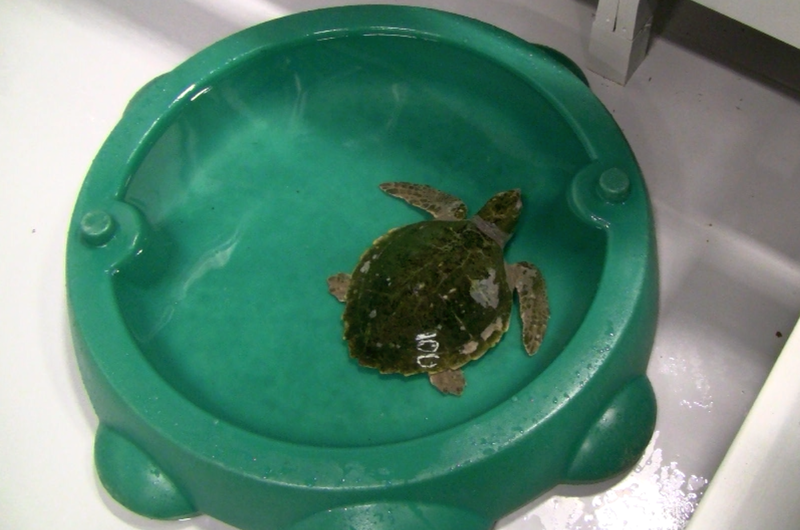 Some turtles were swimming in actual kiddie pools (top) but there were so many that needed to be in shallow water that the staff had to improvise. 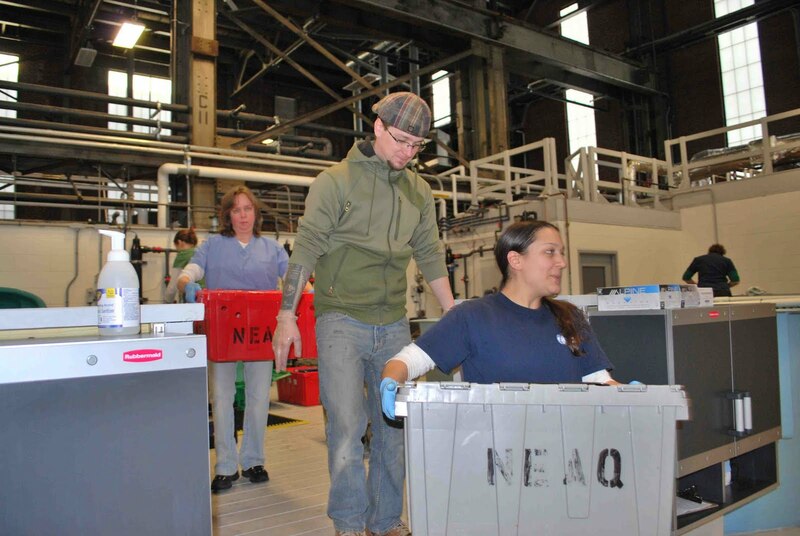 The little guy on the left above is in a container that was designed to transport harbor porpoise. 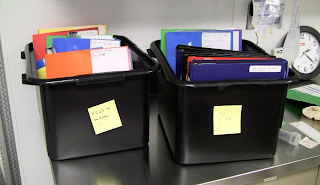 What really took me by surprise is how much record-keeping has to happen. 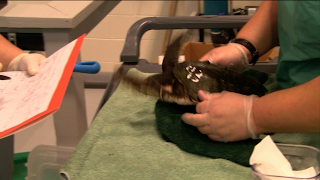 The staff has to make sure that each turtle is getting the treatment it's supposed to get based on its condition. 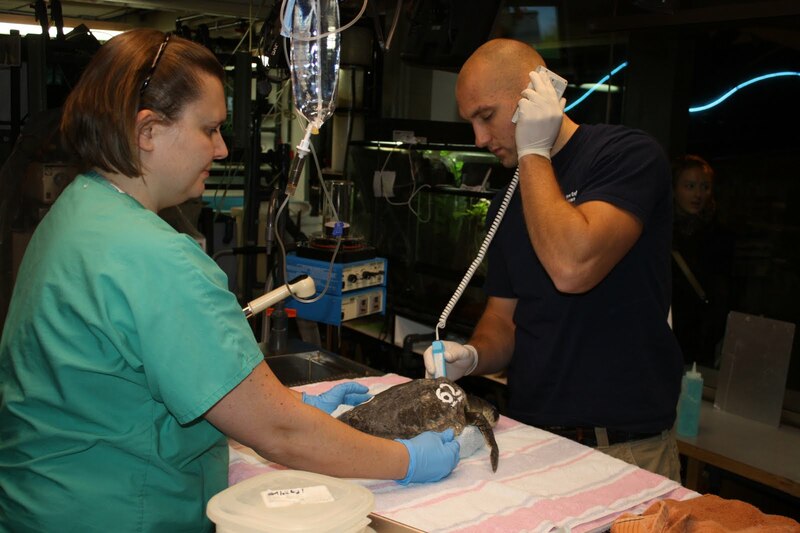 Each animal has a chart labeled with its intake number (the number on its shell) and other information. 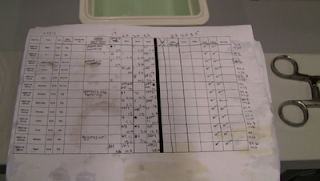 Every time an animal gets a shot of antibiotics, or vitamins, or fluids, the treatment is marked in its chart. Every time the animal is examined, the results of the exam are marked down in its chart. Not only does this take a lot of time, given the number of turtles, it also takes a lot of staff. Each time a turtle is treated, not only does a staff member have to administer treatment, someone else has to hold the turtle. That was my job for much of my day, and it's surprising how much those little flippers sting when the turtles start waving them around. 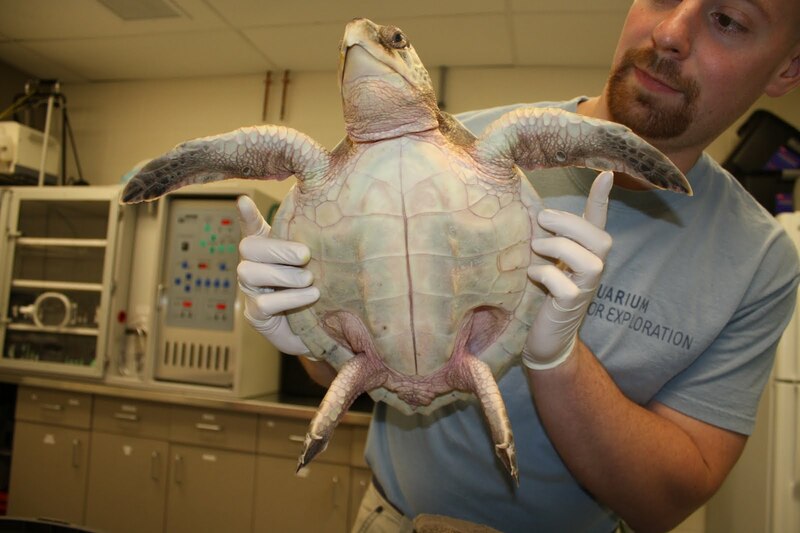 You can see this turtle flapping its flippers as a volunteer holds onto it. It's also not easy feeding 70-plus rescued sea turtles on a twice-daily basis. And it's not quick. 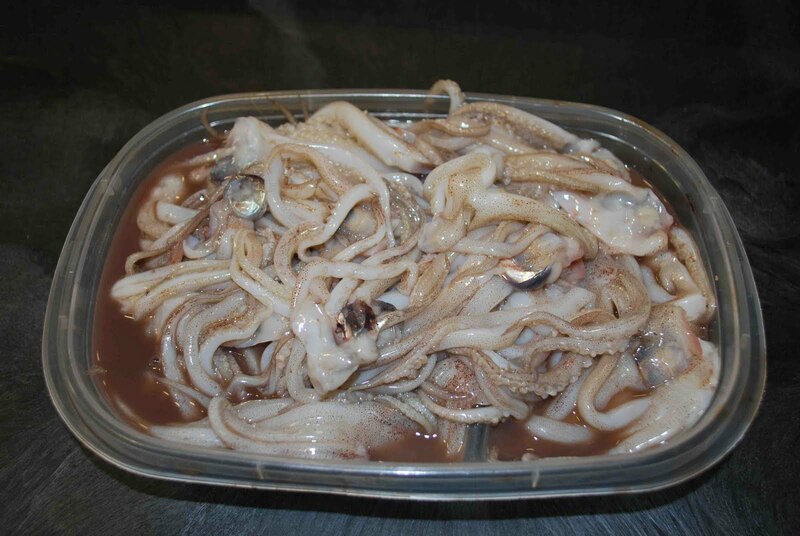 Every day, when squid and other fish is prepped for the feedings, it's cut into carefully weighed portions so the people feeding the animals know how much each morsel weighs. 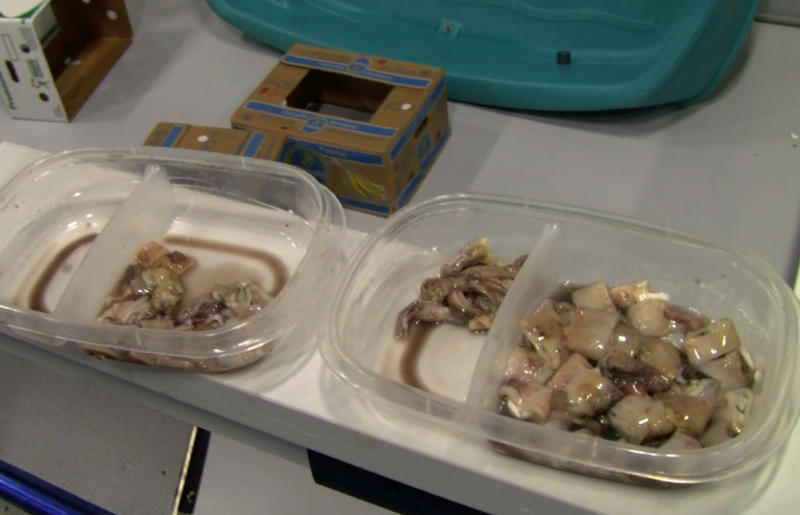 These pieces of squid have been weighed and are ready to be fed to the turtles. 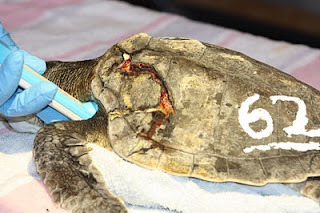 The rescue staff has calculated how much food each turtle should be eating per day, and this amount is written next to the turtle's ID number on the feeding charts. 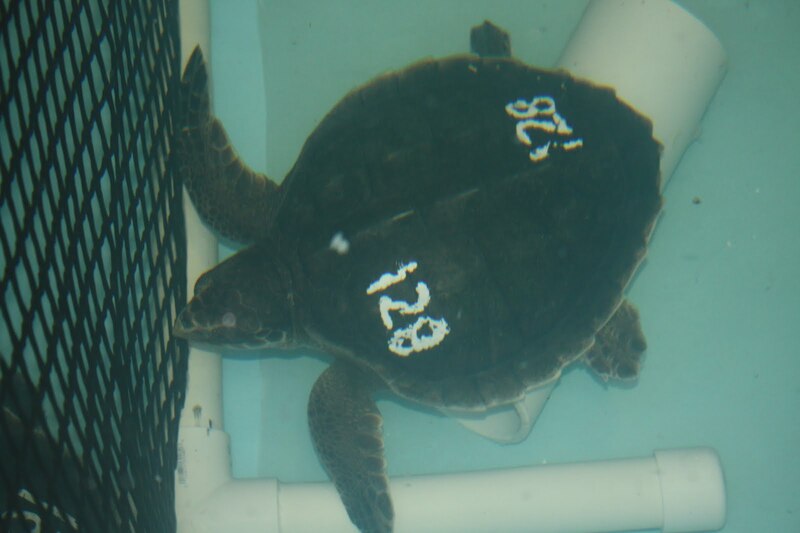 Each time a turtle I was trying to feed ate a squid ring or a portion of tentacle, I had to record it on the chart. Because such careful records have to be kept, each turtle is fed individually. 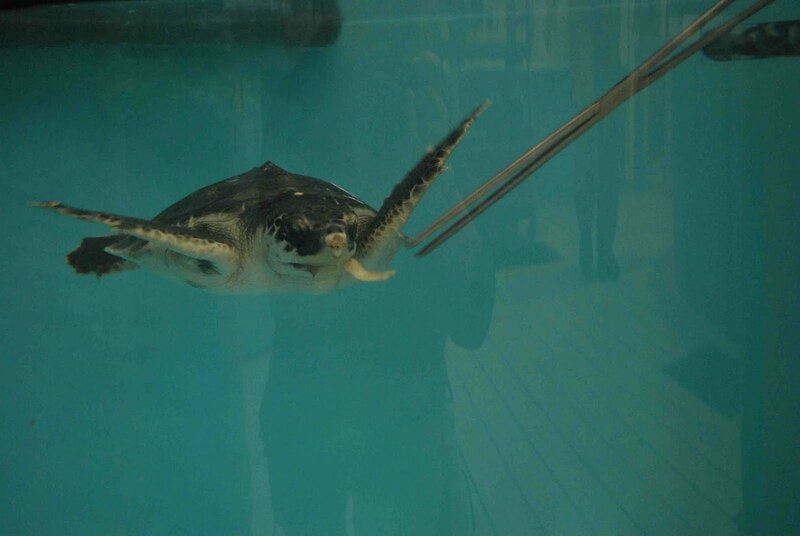 Using long tongs, a staff member or volunteer holds a piece of fish in front of an individual turtle and hopes the turtle grabs it. Holding the tongs takes some coordination; you have to keep the piece of fish in the tongs until the turtle reaches for it, then let go. 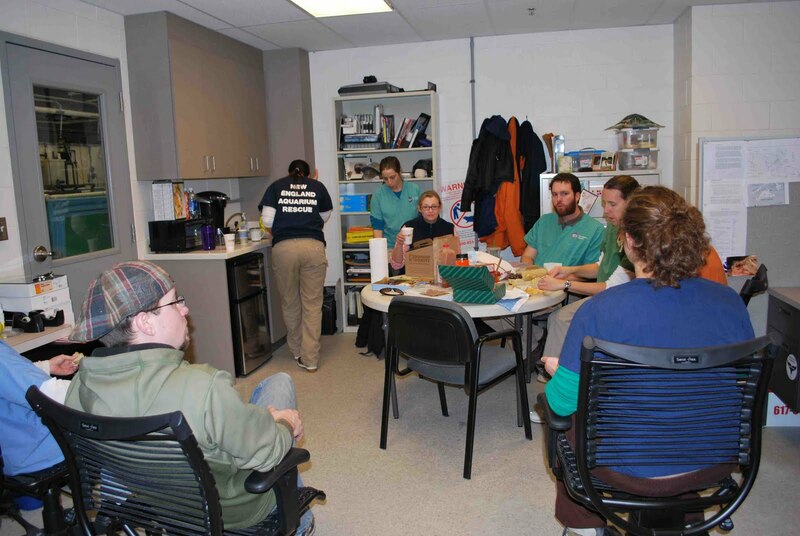 Eventually the animals will graduate and be fed differently but at this stage of rehab they are fed individually. 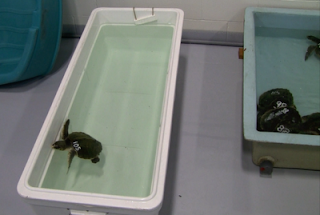 Some turtles snap up the food right away (see the video below), but some need to be coaxed (and coaxed and coaxed) by waving the food gently in front of them. This is so time-consuming that by the time the morning feeding is done, it's almost time for the afternoon feeding to start. And by the time the afternoon feeding is done, it feels like the next day's morning feeding is ready to start! At the end of the day, I was exhausted (and I didn't even really do anything except hold turtles and try to feed them). On my way home, thinking about the day I had spent at the Animal Care Center, I had to shake my head in amazement at the quality of care the Rescue and Rehab staff gives these rescued sea turtles. And they do it every day. Christmas in the sea turtle hospital...who are these great people? Happy Holidays to all our blog readers. 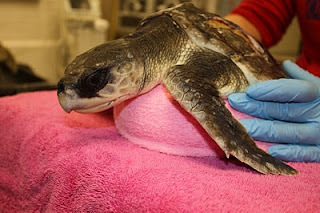 Today's blog is dedicated to the great people who came in today to help us care for these incredible creatures. Enjoy the photos of cool animals and the dedicated and caring people who help them. 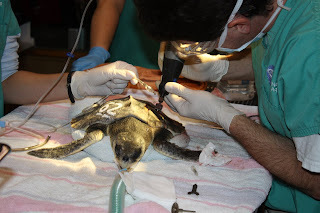 A Kemp's ridley eats a piece of squid on Christmas Day. With a full hospital of endangered sea turtles there is little time for a holiday. 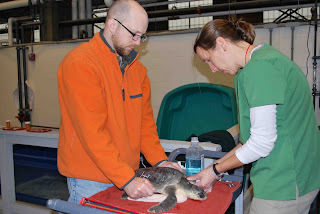 We started our day at 6:30am by setting up for a busy day in the sea turtle clinic. Below is a photo of a few early bird volunteers that came in by 7:00am to help us set up and prepare for a busy day. Once everyone arrived we began removing animals from the water and began our daly treatments. 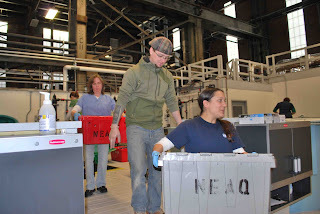 In the photo below you can see animals in their boxes being carried to the clinic for treatments. In the photo below on the left former NEAq senior biologist in the Rescue Department, Kate, gave up her holiday to help the turtles. 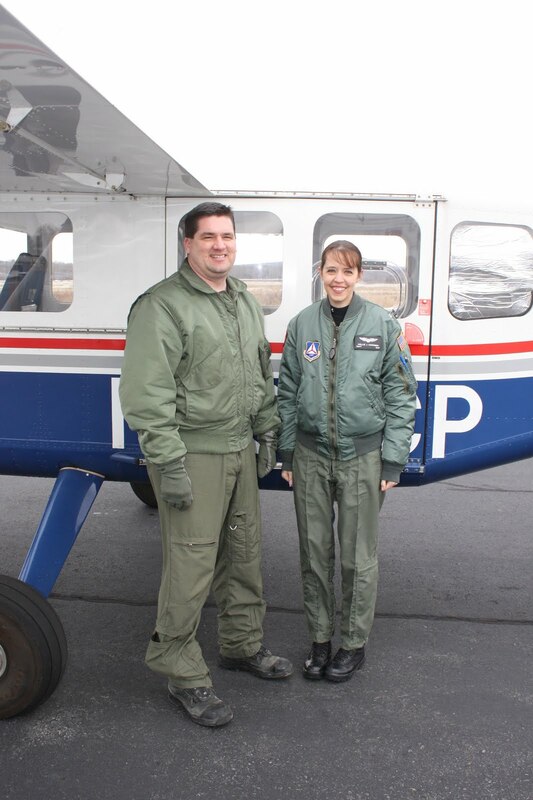 She somehow convinced her husband Dan to volunteer as well - now that's spending quality time together! In the photo on the right our new NEAq senior biologist Katie and volunteer Chris prepare to treat a turtle. 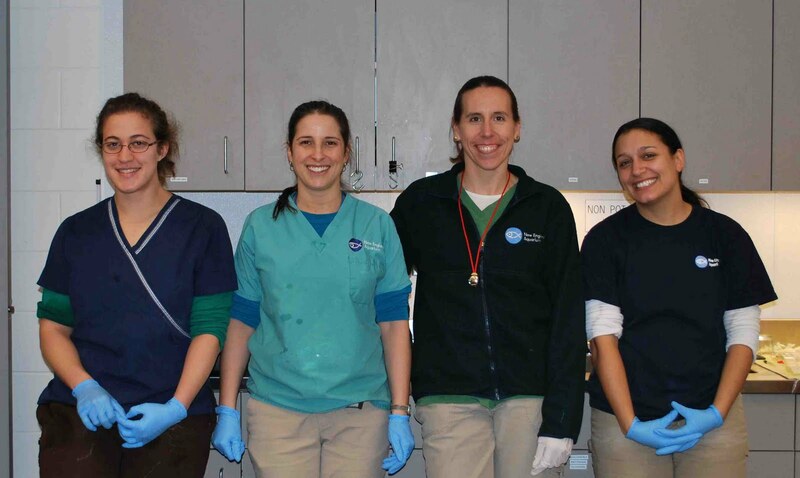 While treatments were in full swing, Casey, Kady and Laura were in the food prep room preparing a Christmas meal for the turtles. 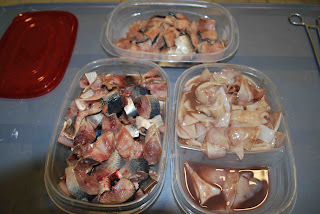 In the photos below you can see the fruits of their labor, herring bites, squid rings and squid heads. 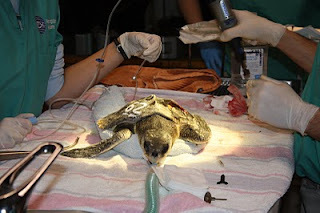 In the photo below Kate, Dan and Kate complete the treatment on the loggerhead. You may have noticed a common theme in these blog photos...there is a Kate, Kady or Katie in almost every photo. 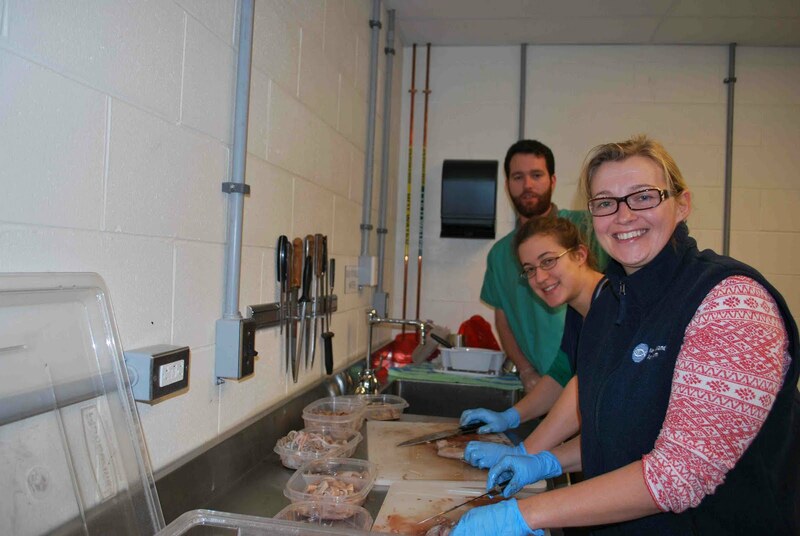 Out of ten of us working on Christmas day we had four Katie, Kate, Kady's. In the photo below from L-R (ha ha!) Kady, Kate, Kate and Katie pose for the "Kates" photo. 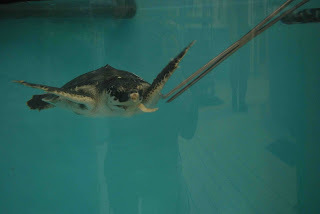 In the photo below, Casey returns the loggerhead to his pool after his treatment. The pool deck was bustling with activity. 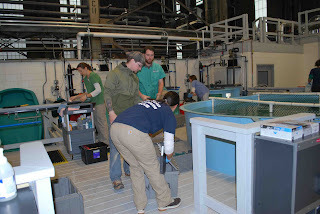 Look at all these great people who came in to help us take care of these turtles. 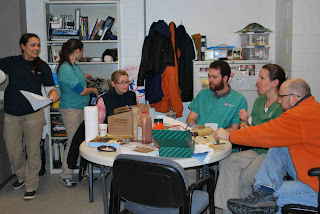 After treatments and before we fed the turtles we took a break to enjoy some holiday treats. As you can see in the photos below there were many naughty treats for us to enjoy and a lot of laughter and good cheer! 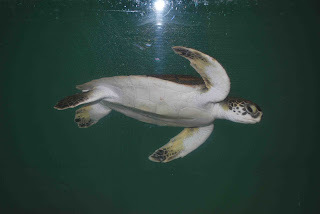 In the photo below on the left a green sea turtle swims past the viewing window. 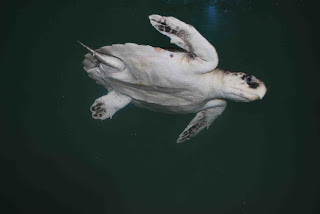 In the photo on the right a Kemp's ridley swims past the viewing window. 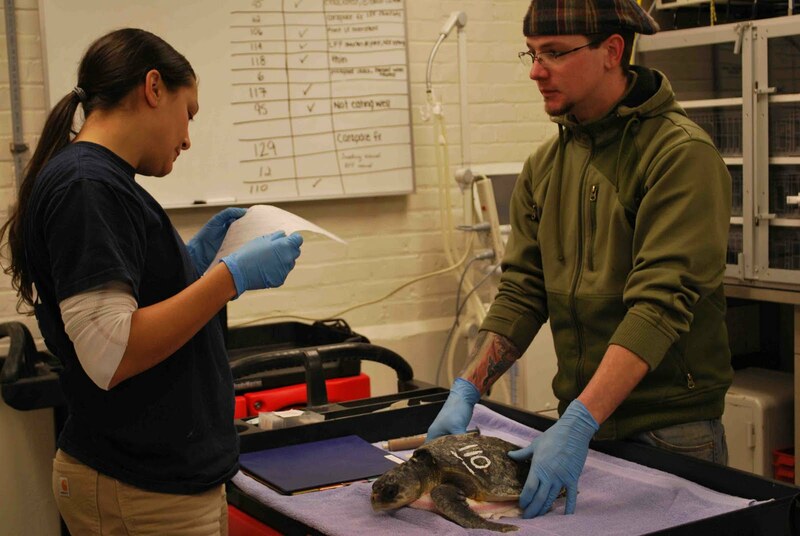 At the end of each day, we do a detailed review of each turtles' medical chart to be sure we didn't miss any treatments. We also organize the charts into bins for the next morning to make it easier. You can see Katie sorting through the charts, while the volunteers feed turtles in the background. 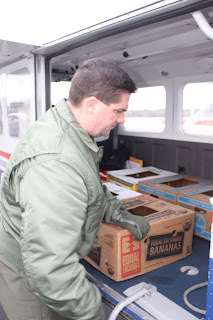 While the Rescue blog is usually about animals - today's blog is about people. The caring people in the photo below and throughout this blog were kind enough to give up their Christmas to come in and help us take care of the many endangered sea turtles that are still here in our care. The photo below shows our Christmas Team from L-R: Kate, Dan, Kate, Chris, Katie, Theresa,Laura, Casey and Kady. 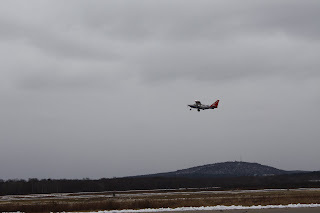 Yesterday, Adam, rescue volunteer Kady, and I took a trip to Norwood Memorial Airport to put 6 more Kemp's ridley sea turtles on a plane to the National Aquarium in Baltimore (NAIB). NAIB was kind enough to take these extra turtles (they took 5 turtles a few weeks ago, which you can read about here) and arrange for the Civil Air Patrol to fly them down. 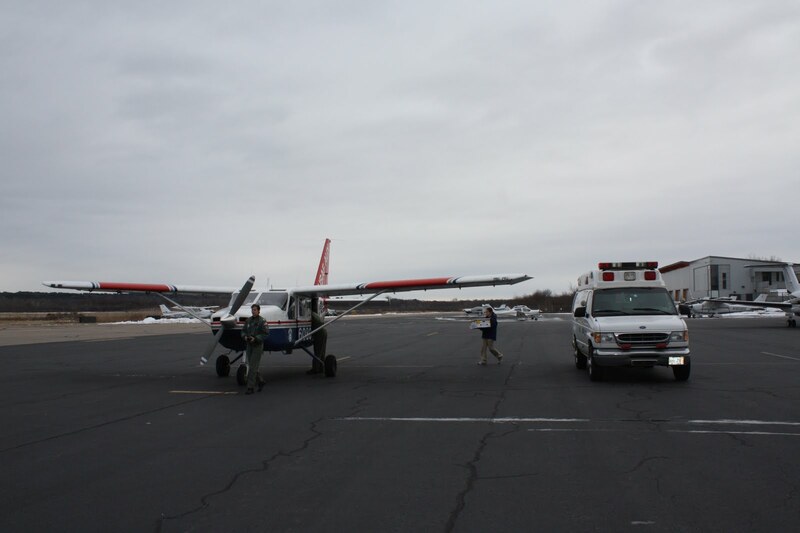 In the above photo on the left, I transfer a turtle from the ambulance to the plane. It was starting to snow so we had to move the turtles fast. 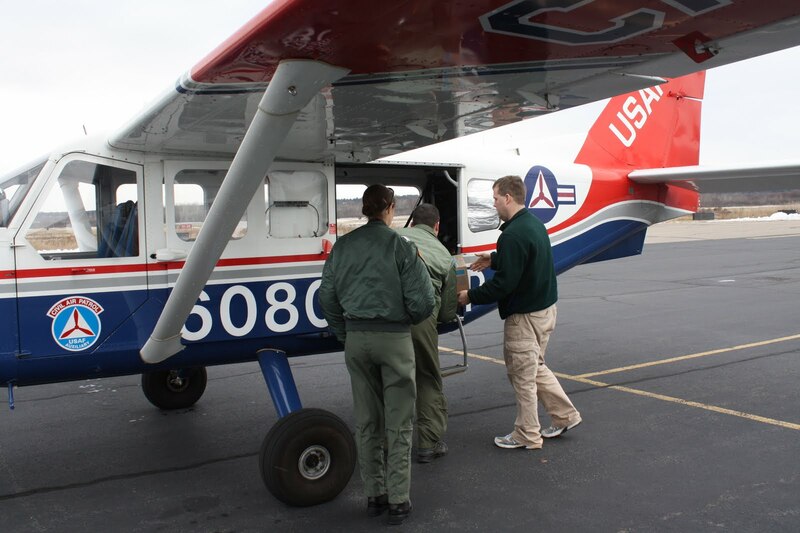 On the right, Adam hands a turtle to the pilot John for placement in the plane. 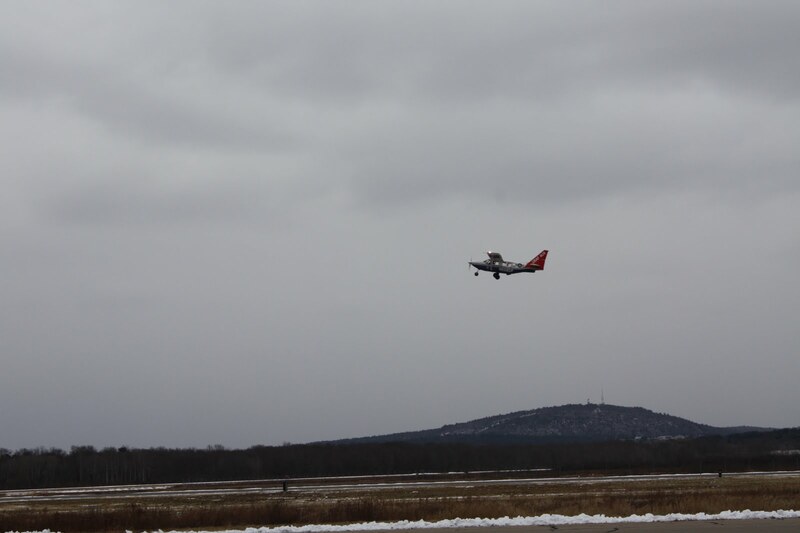 John then secured the 6 turtles in the plane. He seems to be a pro at this now. 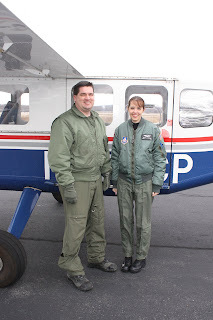 Thank you John and Mollie from the Civil Air Patrol for all your help! 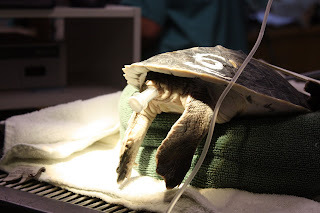 You can read about how these turtles are doing on NAIB's blog here. 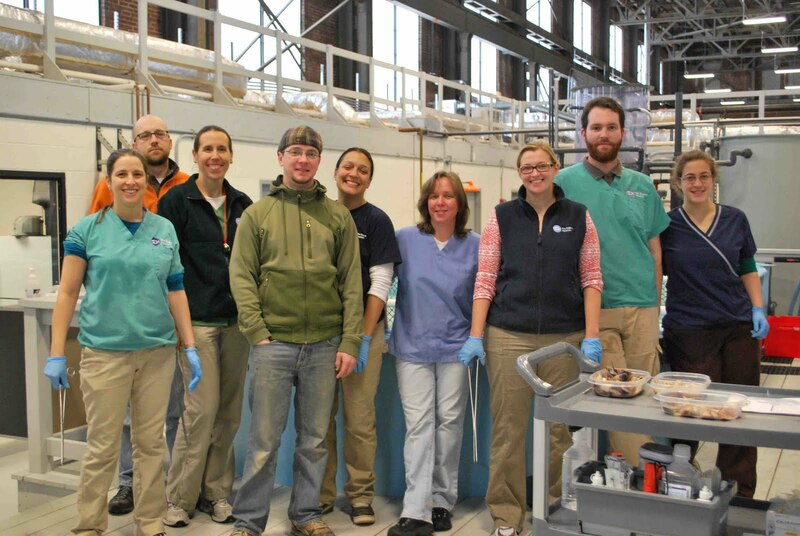 This is a guest post from Senior Aquarium Educator Lisbeth Bornhofft. 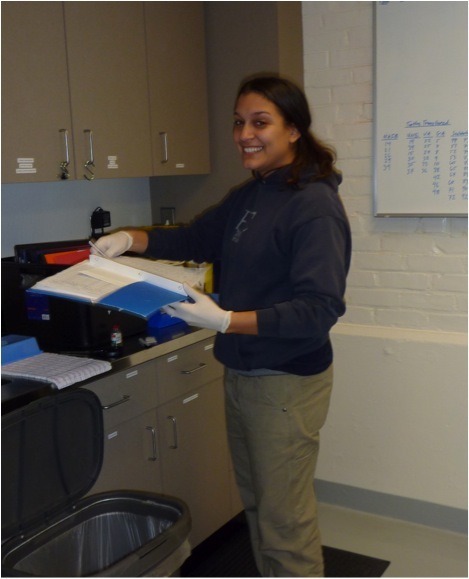 Read about Lisbeth in the Cool Jobs section of the Fall 2010 issue of our blue member magazine. She recently traveled to our new Animal Care Center in Quincy to check on the turtle care efforts and she posted about her day here. After spending a day with the turtles and people in our Rescue and Rehabilitation facility, I felt tired, wet and cold, but I also felt lucky to have the opportunity to help out. 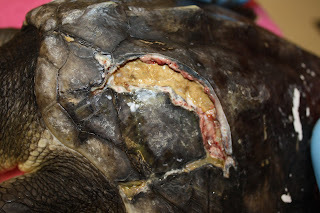 I got to wondering if the turtles "feel lucky" too. 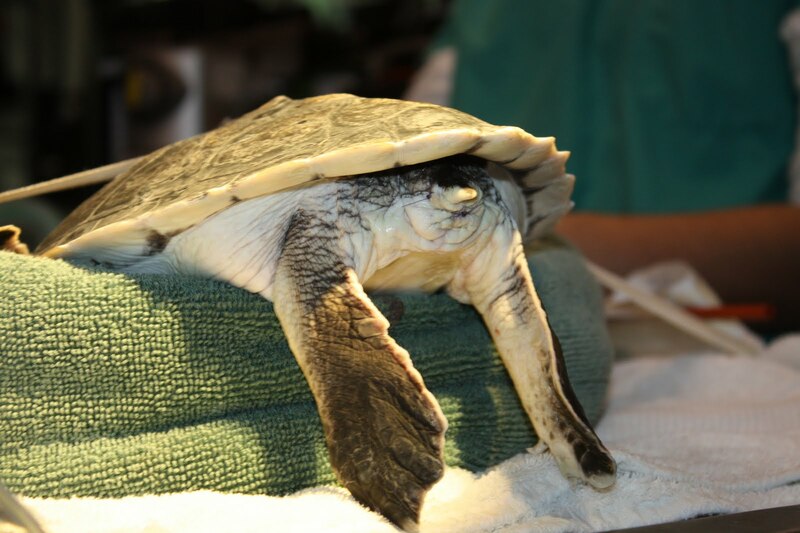 Sea turtles have powerful instincts for survival, but it's pretty well known that turtles don’t feel emotions the way we do. 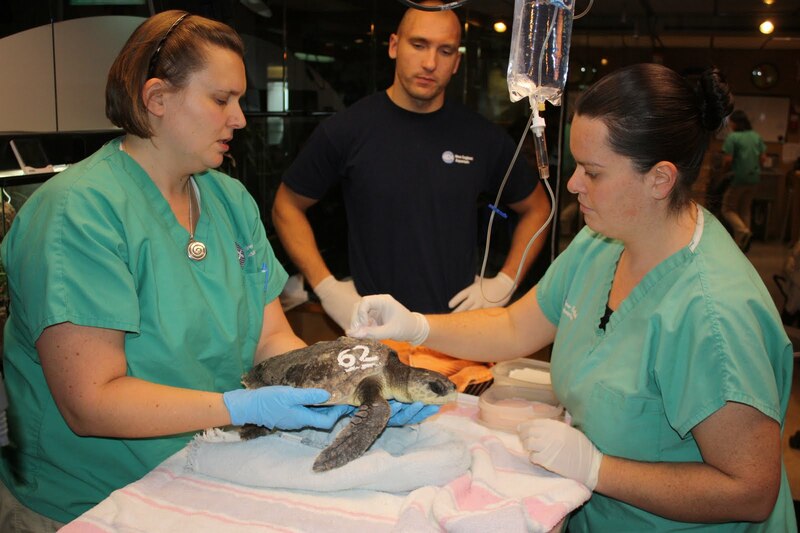 They have no concept of their endangered status as a species, they don’t know that they were rescued from an early demise on a cold beach, and they don’t know how hard so many people are working to ensure their continued well-being. 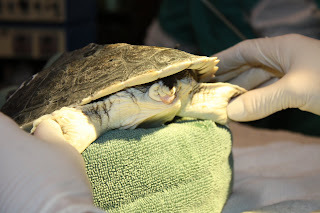 On that day, 53 turtles were receiving treatment. Many received fluids for dehydration and injections of antibiotics or vitamins. That’s a lot of syringes! Several were treated for eye problems. Three different types of drops were used for various eye conditions: anti-inflammatory drops (or as Adam calls them, "ibuprofen for the eyes"), irrigating solution and triple antibiotic solution. 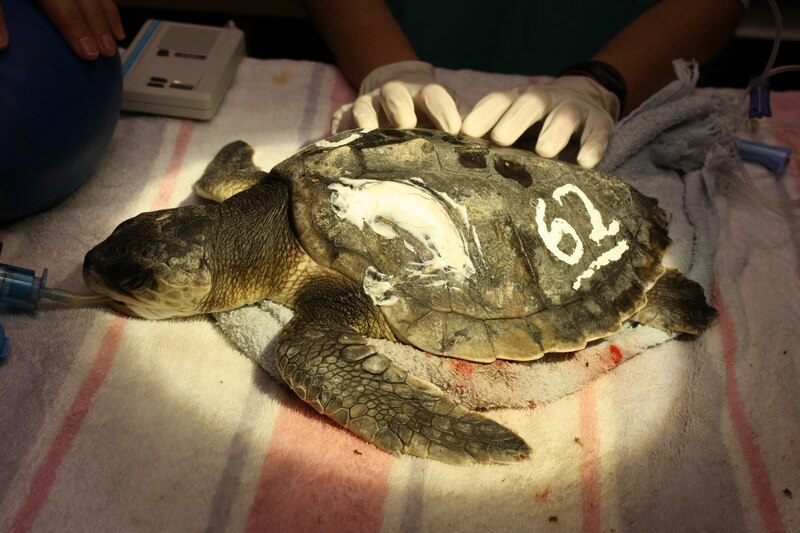 You wouldn't think that we would use a product called Mean Streak, but it's important that every turtle is clearly numbered. 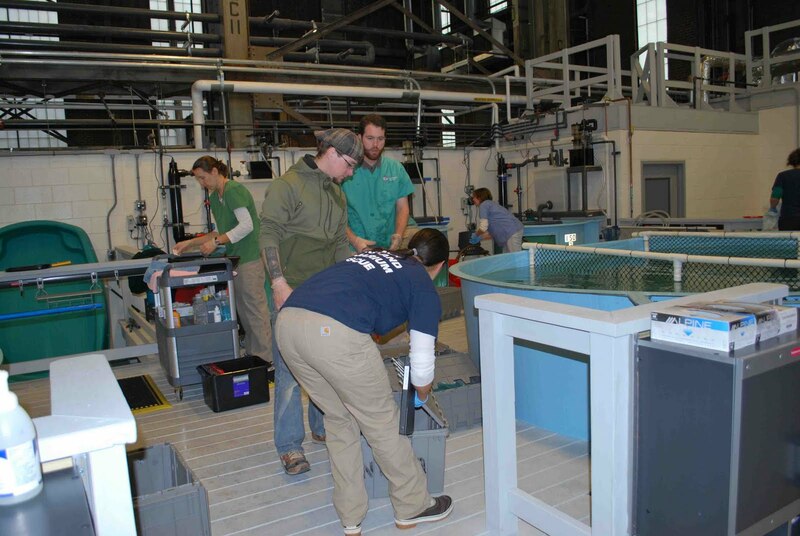 Mean Streak is supposed to be an indelible marker, but it's hard to apply anything to an algae-covered shell that is underwater all the time. The volunteer to-do list for the day was daunting. 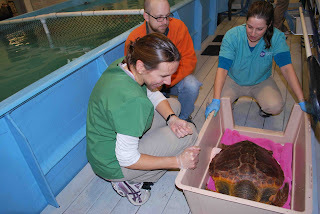 I met Katie Pugliares, a welcomed addition to the NEAq medical team. Here she’s holding one of the dozens of folders needed to keep track of medical treatments, conditions, test results and feeding behavior. 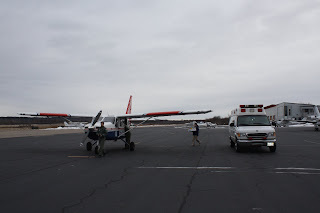 Staff members are not just concerned with the medical condition of the patients. 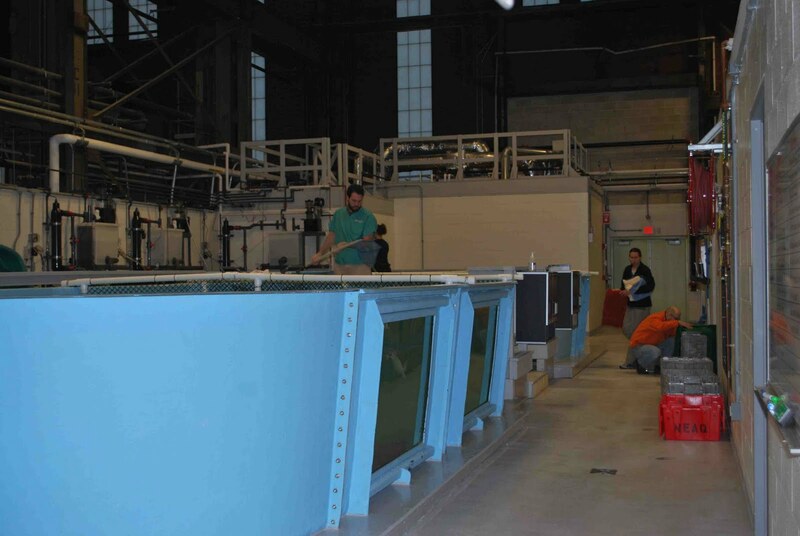 Here you can see Kerry introducing a new object to a pool. It may look like strips of car wash material to us, but to the turtles we hope it resembles the kelp in their natural habitat. 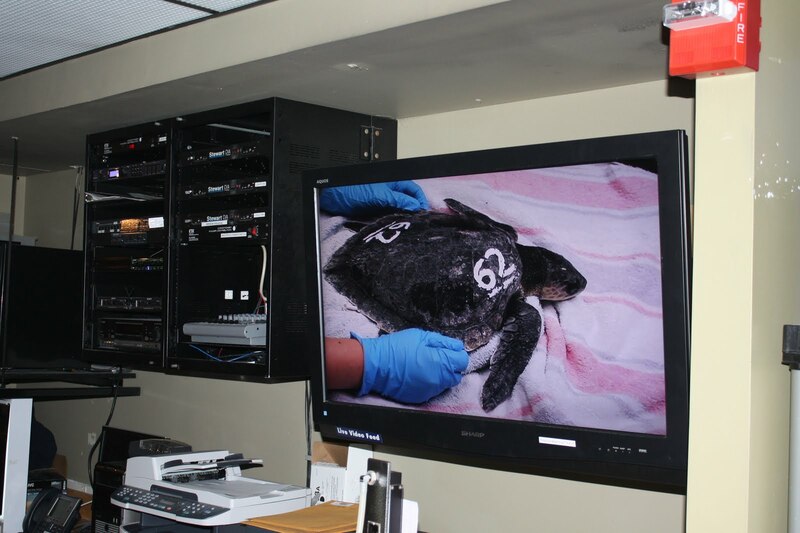 In this clip you'll see that at first the turtles all clustered away from the strip. After one curious turtle inspected the new object, the others soon joined in. One might not consider these turtles to be so fortunate—after all, they've had a rough time of it and they still have a long road to recovery. But as I watched the staff and volunteers who work long hours with barely a break for lunch, I realized that these turtles are indeed the lucky ones—whether they know it or not! Take a swim with turtles on the road to recovery. You may remember Barringer, one of the first Kemp's ridley sea turtles that stranded this season (you can read about him in this post). 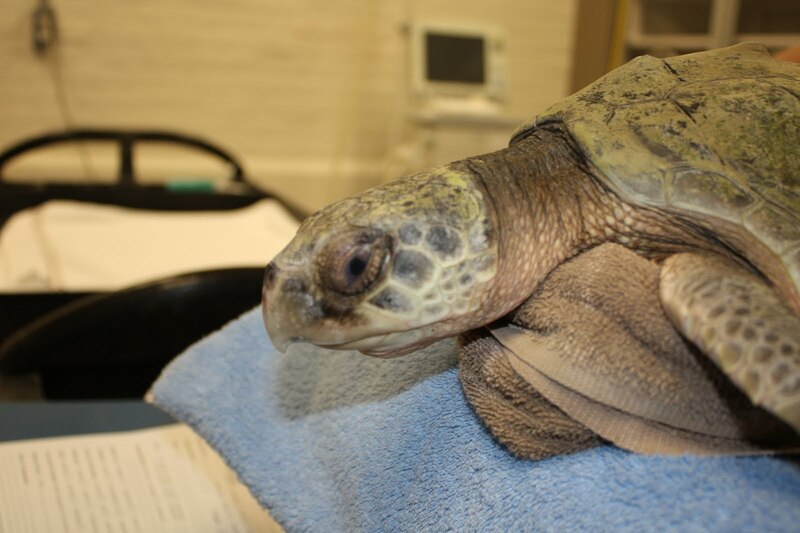 Barringer also made a trip to Boston this week to undergo surgery in the Aquarium Medical Center. Barringer has had a prolapsed cloaca, and it has not been improving, so Dr. Innis decided that surgery would be the best option and off to Boston he went. Above, Barringer is intubated and about to be put on oxygen and gas anesthesia. 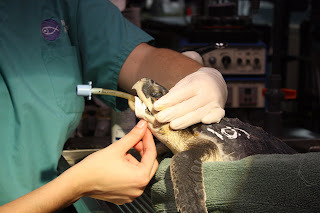 This is to keep him sedated during the procedure and the machine will breath for him. Above, Dr. Innis uses an endoscope to view inside the turtle's cloaca. He was looking to see if there was any inflammation or infection that would cause this issue. 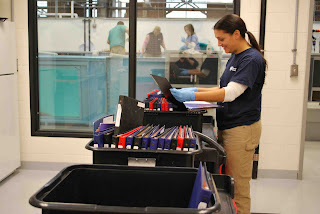 The above video is from the endoscopy equipment. From beginning to end, you will see the opening of the colon, then the opening of the bladder, the first ureter, and last you will see the second ureter. 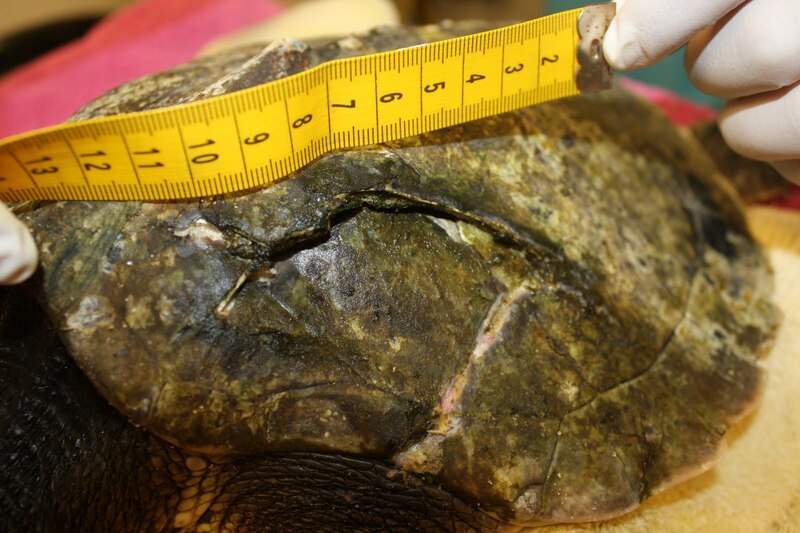 Not many people can say they've seen the ureters on a live reptile! 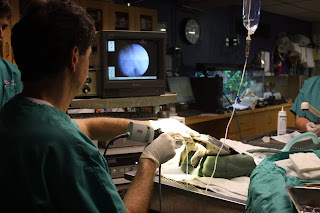 The procedure to repair the cloaca involved using a sterile syringe to push the prolapsed tissue back internally, which you can see in the photo on the left. The photo on the right shows Dr. Innis then suturing the area to keep the tissue in place...inside the turtle instead of outside. The above photos are the before (left) and after(right). Look how much more comfortable Barringer will now be. Barringer had a smooth recovery and was swimming back in his tank as soon as we got back to Quincy. He even already ate yesterday, but we are only feeding him soft foods to make it easier fo excretion. 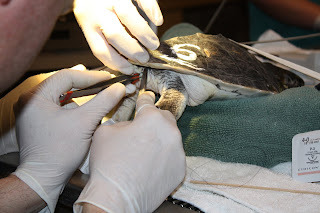 We will continue to monitor the site, and hopefully the tissue will heal well and we can remove the sutures. I'll keep you updated on his progress!